I don’t use it every day. But when I was setting up my home studio, I discovered that I could record higher quality telephone interviews over Skype than over my Verizon land line. This has more to do with Verizon than it does Skype. We had a loud buzz on our phone line, and it didn’t go away after Verizon sent out a technician. So we canceled our underused phone line and I paid up a bit of money to get a SkypeIn number and a SkypeOut calling plan. So when I’m working on a radio story or producing a podcast where I need to interview someone over the phone and record it, I usually have them call my SkypeIn number. Fortunately, I didn’t have to do any telephone interviews this week, so I wasn’t affected by the Skype outage. If I had, there would have been a way around it. Well, kind of. About a month or two ago I signed up for a GrandCentral account. With GrandCentral, you can give people a single phone number to call, and it will ring any phones you’ve associated with that number. I’ve set it up to ring my SkypeIn line and my cellphone. So if I had been waiting for someone to call me back to do an interview, my Skype line wouldn’t have rung, but my cellphone would have. And if I didn’t answer any phone, the call would go to my GrandCentral voicemail and I’d get an email notification. I wouldn’t record audio over my cellphone. Although GrandCentral lets you record calls, it sounds like crap and there’s no way to mute my side of the conversation. But I would have been able to reschedule or to conduct an informational interview that wouldn’t be used on air. If I had a land line, I would have been able to call them back on that. Google purchased GrandCentral a few months ago. And now I’m starting to understand why. Perhaps GrandCentral features will be integrated into GTalk, much the way I’m currently using GrandCentral with Skype. Give someone your GrandCentral number and if you’re at your PC you can take the call there. If you’re on the go, you can take your call in the supermarket. It’d be nice to see Skype offer a similar service, especially in light of what happened this week. That said, Skype (which is owned by eBay) would probably charge for such a service, while Google has a tendency to give these sorts of services away for free. 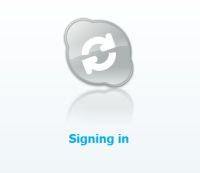 If that happens, perhaps I’ll be switching from Skype to GTalk in the not too distant future. As long as the network doesn’t crash too often. I have just learned of a service called Gizmo that is very similar to Skype. Given that I have just heard of it, I will assume that it’s installed base is a small fraction of Skype. Nevertheless I believe that GrandCentral can use Gizmo as a forwarded number – hence free telephone to computer porting. I have just learned of a service called Gizmo that is very similar to Skype. Given that I have just heard of it, I will assume that it's installed base is a small fraction of Skype.